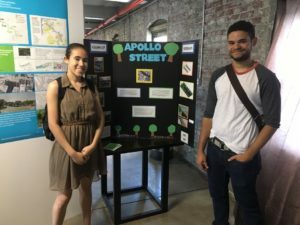 On Saturday, June 3, WHSAD seniors Autumn Gonzalez and Johnny Rodriguez attended the Newtown Creek Alliance’s Community Visioning Workshop with Riverkeeper to present their Apollo Street renderings to the community. Y-PLAN Environmental Science students first participated in the April 1st Apollo Street-End Clean-Up (see post), and then collaborated with NCA to envision and design a future Apollo Street using AutoCAD. The Newtown Creek Alliance is a community-based organization working to restore, reveal and revitalize Newtown Creek to its glory days as a local wildlife habitat. WHSAD looks forward to future collaborations towards making Newtown Creek a cleaner place. To learn more, click here.